SF Beta, held at 111 Minna last night, was all about Justin.TV, who came and was mobbed as soon as he walked through the door. 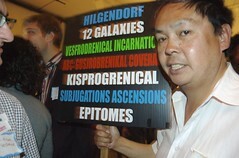 But for me, the real star of the event was Frank Chu, who clearly was there for the free food. As you can see, he brought his sign. He actually put it down in a corner so he could house the buffet and L.A. and I joked about stealing it. Frank must have sensed how depraved and scandalous initialed people are because he almost immediately went over and grabbed his beloved HILGENDORF.